Prince Tonye Princewill the Rivers State AC Leader has described the just concluded Action Congress National Convention held last Saturday in Lagos as a resounding success. He said certain resolutions passed in the course of the Convention could be considered as one of the greatest gifts the AC (National) as a party could give the Rivers State AC Chapter. He enthused thus “The outcome of the Convention has not only placed the party as the party Nigerians can count on to salvage the country from its moribund state in the hands of the PDP, but also one that would reposition the country to favourably harness and exploit its great potentials as a world power”". With the statements and various positions canvassed for by the leadership of the party at the convention, the future of our country remains very bright. Come 2011 Nigerians will have an alternative to the evil that PDP represents at the national level. Most importantly the AC has by the successful completion of its convention, demonstrated that apart from being virile, and visionary, it is united in its resolve to give Nigerians a credible alternative for the 2011 general elections with the likes of Atiku Abubakar, Tinubu, Tom Ikimi and Senator Obi and other great Party stalwarts united in the struggle. Following the nefarious activities of certain anti-party elements hoping to hijack the party machinery to cause disaffection and confusion in the party by suspending Atiku, Usman Bugaji, Timi Frank, Prince Tonye Princewill and others from the party, we applaud the resolutions passed at the Convention that terminated such an evil plot and see it as a well deserved gift to the Rivers State AC. With the eminent collapse of this evil plot against the party, we pray that such elements will now allow the party to build the party as a formidable structure to salvage the country from its hopeless and cancerous state. With this development coupled with the strength and inputs given to us by the National Leader of the party, Alh. Atiku Abubakar, during his visit to Port Harcourt, those of us in Rivers State AC are now geared to restructure and better position the Chapter as a formidable political structure in Rivers State for the total emancipation and growth of our dear State”. With the commissioning of the new ultra-modern State Secretariat described by the National Leader of the party during his recent visit to the State as one of the best State Secretariats in Nigeria that can conveniently serve as the National Headquarters of any political party in Nigeria. The Secretariat with all its modern information Technology and accessories was acquired by Prince Tonye Princewill as part of his commitment to ensuring that the party in the state is not devoid of well needed infrastructure in its bid to reposition itself. We expect the National Leadership of AC to continue to rally round the Prince to reposition and rebuild the Chapter to the benefit of all and sundry, whilst we urge them to ignore all unprogressive elements who wants to destabilize the Chapter. Highlights of Alh. 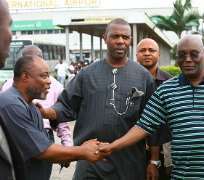 Atiku Abubakar's visit to Port Harcourt included a call on the Governor of Rivers State, Rt. Hon. Rotimi Chibuike Amaechi. At the event the Turakin Adamawa assured the Governor of his love for the state. He commended him for the developmental efforts of his administration and his resolve to work with Prince Tonye Princewill and the opposition in a trail blazing political model that could very well set the trend for the political future of the Nation. Rt Hon. Rotimi Chibuike Amaechi the Executive Governor of Rivers State used the opportunity to state that he is very aware of the problems and difficulties our people are currently going through because of the on-going road projects in the State but will like to assure them that by the time dry season sets in we all will have cause to smile. “What I need from our people is time and patience and we will collectively turn our State into a model for others to follow”, Amaechi enthused.